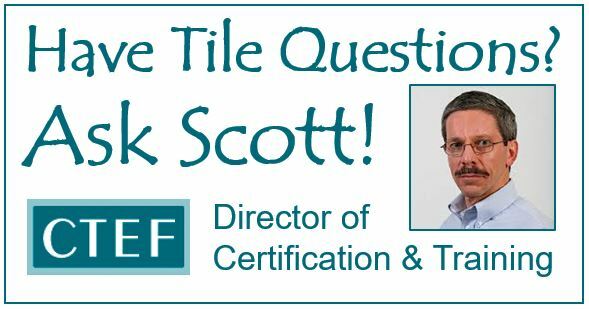 How prepared are you for installing Large Format Tile (LFT) or Gauged Porcelain Tile Panels (GTPT) and ensuring you have a surface that is adequately flat? It's a big deal and worth considering before you get started. Large format tile or gauged porcelain tile panels: Tile sizes are growing significantly! What can happen if the surface isn't flat enough? Why should you never flatten a surface with thin set? How do wedges and spacers affect surface flatness? Before installing large format tile or gauged porcelain tile panels/slabs, look at the surface! Is it flat enough? Tile sizes are increasing. Large format tile has grown from the old 8” x 8” to 12” x 12”, 12” x 24”, 24" x 48" and beyond. You'll even find Gauged Porcelain Tile and Gauged Porcelain Tile Panels/Slabs (GPT&GPTP/S) ranging from 1 meter x 3 meters (roughly 39” x 10’) up to 1.60 meters x 3.20 meters (roughly 63” x 126”). Not only are sizes increasing, but larger sized tiles have been fully embraced by residential and commercial building owners and specifiers. However, there is a difference between Large Format Tile (LFT) and Gauged Porcelain Tile and Gauged Porcelain Tile Panels/Slabs (GPT&GPTP/S). This means that a gauged porcelain tile product that is less than 1 meter x 1 meter (39-3/8” x 39-3/8”) is considered a large format tile. However, a tile product 1 meter x 1 meter or larger is considered a gauged porcelain tile panel or slab. How to determine the flatness of the floor or wall? Determining the flatness of the floor or wall is relatively easy by using a ten-foot straightedge. 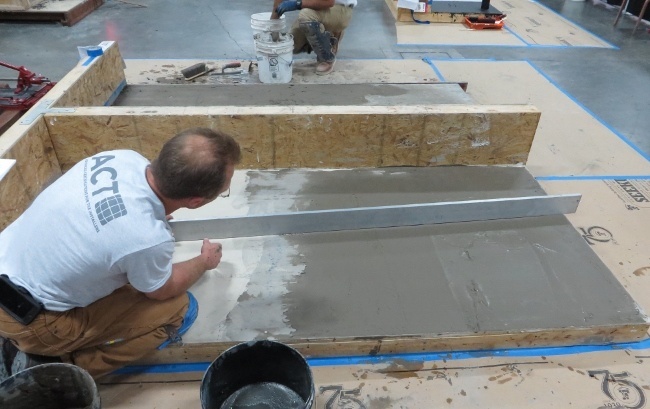 Using a combination of cementitious patching compound (either trowel applied or self-leveling) with the recommended primer fill the low spots and grind down the high spots (be aware of and comply with the OSHA guidelines for grinding). This will normally provide a surface that will be suitable for installing tile within the prescribed tolerances. By the way, you should never use thin-set or large and heavy tile (formerly medium bed) mortars to flatten the substrate. Notice in the image above taken during an Advanced Certifications for Tile Installers (ACT) test, how the installer is using a straightedge to determine if the trowel applied patch is flat enough to receive a 12” x 24” porcelain tile with a 1/8” grout joint and still be within the lippage requirements. Realize that the allowable lippage for this tile installation (with a grout joint less than ¼”) under ANSI Specification A108.02 section 4.3.7 is just 1/32” (about the thickness of a credit card). If the floor or wall is not flat, the installer has significant difficulty when installing the tile. The constant lifting and resetting of the tile to ensure that the tile surface is smooth and flat wastes a huge amount of tile. When the tile edges are not flat with each other, the resulting lippage is unappealing to view, but it can also be a tripping hazard for those walking across the floor. And understand that the installer is responsible for this condition and can be sued for negligence. Alex, thin set and large and heavy tile mortars are designed specifically to install ceramic tile products, but they were never intended to patch or “fix” the wall or floor. Almost all of today’s mortar manufacturers make cement-based patching materials to fill the low spots and flatten out the high spots on both floors and walls. These products are formulated to bond to almost any clean and properly prepped surface and dry in about one hour depending on temperature and humidity. Conversely, if thin set is used to patch a surface, it normally takes twelve to twenty four hours to harden (A lot of wasted time). Additionally, if the thin set in applied thicker than the recommended ¼”, it will shrink significantly. Unfortunately, some installers set tile over out of flat substrates by filling the low areas with thin set as they go. This “extra” mortar plus the mortar applied with a notched trowel will be well beyond the manufacturer’s recommendations. As the mortar begins to set and cure, it shrinks, pulling the tile with it. This produces post-installation lippage which was not present when the tile was installed. A simple word of advice, use thin set and large and heavy tile mortars to install tile and patch for making the substrate flat. I am afraid just don't do something as in, don't use thinset to flatten floors because it will fail does not explain why. As installers we are always looking for the why something has not work. We manage risk of not following standards and practices, customers’ expectations of schedule and budget job site conditions. We do this while attempting to run a business. 75-80% of all wall and floor substrates I work on do not meet tile standards for flatness! You give us one message and product manufactures give us conflicting info, (grout boost or Schluter) and installers have our own experiences which also is often conflicting with manufacture standards and or NTCA standards. I understand the importance educations plays in trying to improve industries operating frame work but there is a long way to go. Victor, I believe I have provided the “why” in the above response. Not following industry standards and best practices may get the job done in order to meet the customer’s expectations of schedule and budget, but if and when the job fails, the installer is on the hook for the replacement, I will grant you that job site conditions are most times terrible and should never be unacceptable. But we, as installers, continue to “accept” a filthy work space, bad substrates, and take jobs for less money than the job requires. We need to stop accepting this poor treatment of tile installers and push for better conditions. If more installers just said no to the above, these conditions would disappear. I know that it is not easy, but it needs to start somewhere. The only message I (along with many others seeking to improve the tile industry) provide comes straight from the TCNA Handbook and ANSI specifications. Realize that these standards are the minimum requirements and that the manufacturers meet or exceed these minimums. This means that the manufacturer’s guidelines should follow the applicable standard and there should not be any conflict. As installers, we should follow the manufacturer’s recommendations to the letter so that the warranty which they provide, will enhance our installations. Thank you very much. It is very informative. I have lows and downs on the concrete floor I am intending to tile. It is evident the 600 x 600 tiles are not falling flat, however, I am planning to use the wedges and spacers to level the tiles. Have done a mock and the result is not too bad, tiles are levelled within tolerances, however, I am afraid at some point pressure from the wedges may build and snap the tiles...what is your experiences with these? Any recommendations? Amis, I am not certain that I completely understand your question, but I will give it a shot. I believe you are describing the lippage control systems or devices, formerly known as edge leveling clips, which are placed between two tiles to bring their top surfaces in line with each other. These devices work well only if they are used in accordance with the manufacturer’s recommendations along with the ANSI requirements for substrate flatness. As noted in the first answer above, the surface to be tiled, in your case the floor, must be flat within 1/8” in 10’ when measured from the high points of the floor. To achieve this, be sure to use the appropriate patch or self-leveling compound (with the same manufacturer’s primer), but never thin set mortar. For a large format tile such as yours (approximately 24” x 24”), in a dry area, the required mortar coverage on the back of the tile must be 80%. The only way you will know if you have met this requirement is to occasionally remove a tile to check the amount of mortar on the back of the tile. If the tile installation is completed in this way, any point load such as a woman’s high heeled shoe, a refrigerator, or pallet jack, the tile will not be affected and will stand the test of time. Before starting your next job, look carefully at the surface that is to receive tile. What will it take to make it flat enough to install large format tile? Identifying substandard jobsite conditions and requesting a change order before the job starts will increase your chances of getting paid for the quality work you have provided. And, don't even think of trying to “fix” the floor or wall surface as you go with thin-set mortar! It doesn't work and is a bad practice which will almost always result in an unsatisfactory finished product. Remember, thin set was formulated to set tile and be about ¼” thick (depending on the manufacturer) after the tile is embedded and about ½” thick after the tile is embedded in a large and heavy tile mortar. Using the right product will provide much more satisfactory results than creating a hybrid which does not come with a warranty. Note: This article was originally published on January 11, 2017 and has been updated.